The picture above shows the second nest found at Fowey in Cornwall today by bee inspectors and destroyed. 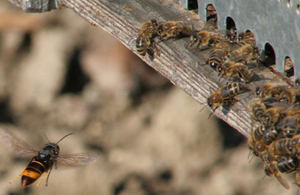 Defra says a hunt for further nests is continuing aided by local beekeepers. A second nest in Fowey, Cornwall, has been destroyed and the public are asked to remain vigilant for Asian hornets. The National Bee Unit has located and destroyed a second Asian hornet nest in Fowey, Cornwall. Investigation work by the National Bee Unit has continued in the area since the discovery of a nest in the town earlier this month. That nest was promptly destroyed and removed. Work is now on-going to ensure no further nests are present. Local beekeepers in the surrounding area are supporting this effort, including in Liskeard where a single sighting of an Asian hornet occurred. Members of the public are also encouraged to report any further sightings of Asian hornets. While the Asian hornet poses no greater risk to human health than a bee, we recognise the damage they can cause to honey bee colonies. I am pleased our well-established protocol to contain them is working so effectively in Fowey. Intensive surveillance by inspectors from the National Bee Unit has taken place around Hull, East Yorkshire, after the finding of a dead Asian hornet in a house. No further Asian hornets have been seen in the area. There is no evidence to suggest the sighting in Hull is linked to the sightings in Cornwall. It is reassuring that we have seen no further hornets in Hull however the discovery of a second nest in Fowey emphasises the need for continued vigilance. During September the number of hornets in a nest can reach a peak and this will increase the chances of members of the public seeing this insect. I want to encourage people to look out for any Asian hornets and if you think you’ve spotted one, please report your sighting through the Asian hornet app or online. If you suspect you have seen an Asian hornet you can report this using the iPhone and Android app ‘Asian Hornet Watch’ or by emailing [email protected]. Identification guides and more information are available.